The Boost set is out there and ready for young, future roboticists (or just people wanting to have fun). 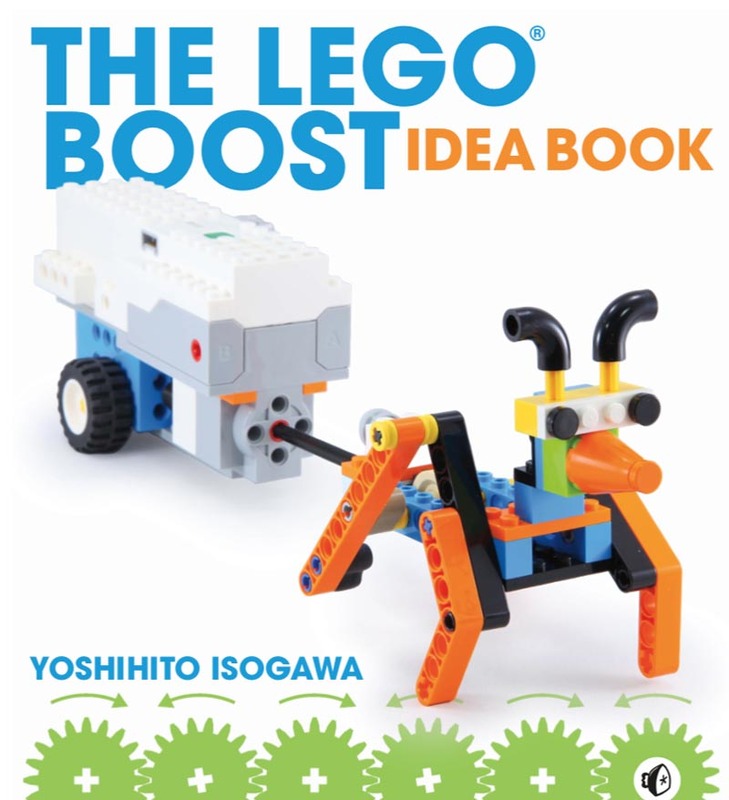 What better way to start this rewarding foray into science than with another excellent book by Yoshihito Isogawa, The LEGO Boost Idea Book. Yoshihito Isogawa is a prolific author of LEGO books. Specialized on Technic and robotic LEGO sets, this Japanese author has over 40 years of LEGO experience, and it shows. 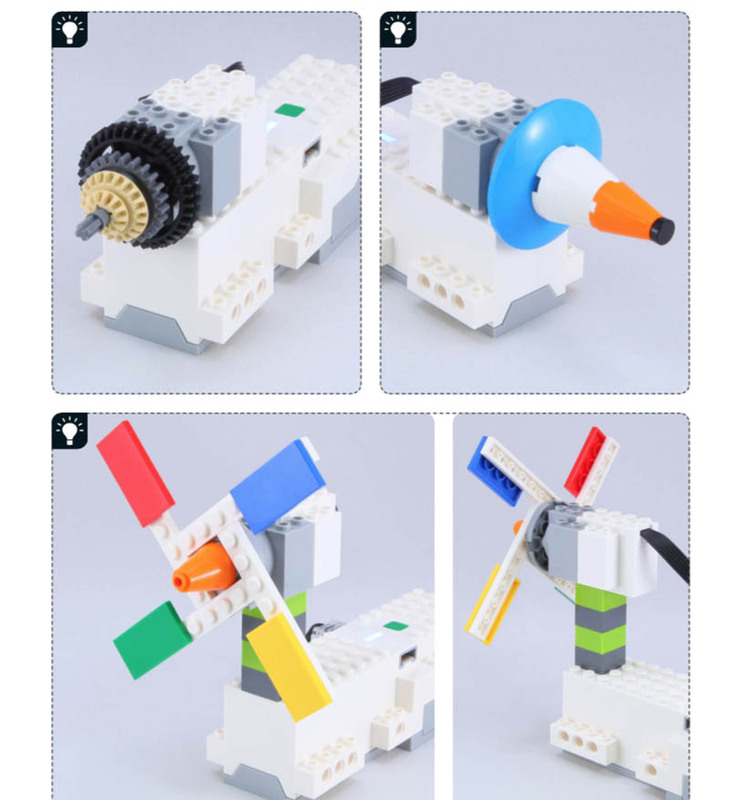 This book, LEGO Boost Ideas, brought by No Starch Press, follows the level of excellence of previous books by Isogawa. Rather than a lengthy technical treatise, it’s a creative inspiration for aspiring builders. Boost is the newest robotic kit from LEGO. 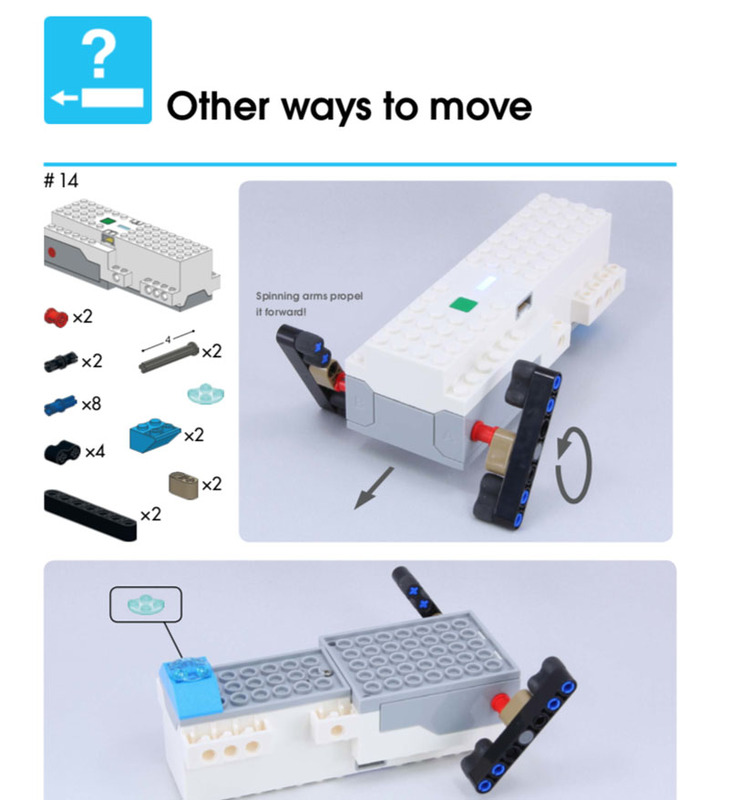 Simpler than MINDSTORMS, it’s more appropriate for children and a non-technical audience. It connects with an iOS or Android app which is easy to find and download. Its programming involves no code, being all visual instead. In spite of this simplicity, it’s still a very powerful tool and this book shows it. Readers should know, however, that this isn’t meant for a complete stranger to the Boost kits. The book works with the premise the reader knows enough about Boost and wants to go beyond the projects offered by the app. Luckily, it also suggests where the reader can find a complete guide for the Boost kits. The book also warns that it uses level 2 difficulty for programming (out of three, so nothing too drastic). You’ll have to have finished some Boost projects before, as well. That said, let’s explore the book! You won’t find a lot of words in this book. Instead, it focuses on progressive projects. The projects themselves come in easy-to-follow categories, which get more complex as you go. This feature allows for a smooth transition from basic projects to more elaborate ones. As the projects are not necessarily related, more experienced builders don’t need to follow all of them. There is a total of 95 projects in this book, focusing on mechanics and function over beauty and style (which isn’t to say they are ugly; they’re not). These will walk you through creating motion, sensory and other mechanisms, from moving with wheels, to flapping mechanisms, to drawing and using colour and tilt sensors. The wide gamut of options makes it so it’s a good reference to your own ideas if you’re stuck on how to work a particular mechanic into your cool robots. Or, you can also combine ideas provided in the book and create your own — such as mixing sensors and walking machines, and so much more. Like other Isogawa books, each chapter focus on a specific type of mechanic and the various things and ways you can build with it. In this book you will find three chapters in total — moving with wheels, moving without wheels, and using sensors and other features. The introduction of the book is the only textual content and it includes a note on the intended audience as well as a minor “crash course” on how to use the programming app. Onwards, it’s all pictures. The book’s introduction chapter is the only text there is, bar some hints and guidance throughout projects. The instructions for the projects are entirely visual, and thus, readers will need to figure out some details by themselves. This also applies to the programming instructions — they, too, are visual. While this adds a slight complexity to the projects, they’re easy enough to follow once you get used to the book’s system. This is also done on purpose. This is an idea book, meant to inspire readers to elaborate on what is shown, rather than simply follow written instructions. The difference is important. If you are after exact projects or technical instruction, this book is not for you. There will be learning — but don’t expect a textbook on robotics, physics or the Boost system. Instead, you will learn by putting the ideas into practice and improving on them. The whole book has a very nice look and feel. As with all No Starch books, it comes in both physical and e-book. We have analyzed the e-book version (PDF). The guides are clear and simple, demonstrating what needs to be done without breaking down too much (intentionally, so it’s cool). High-quality colour photographs illustrate the steps. While, as mentioned, it does not come with written instructions, those do appear when introducing new concepts, and showing proportions. Written instructions are minimal and limit themselves to proportions and occasional explanations. While the chapters categorize and separate subjects quite neatly, the projects do seem to follow a logical progression. Each project comes with the pieces needed to build it. 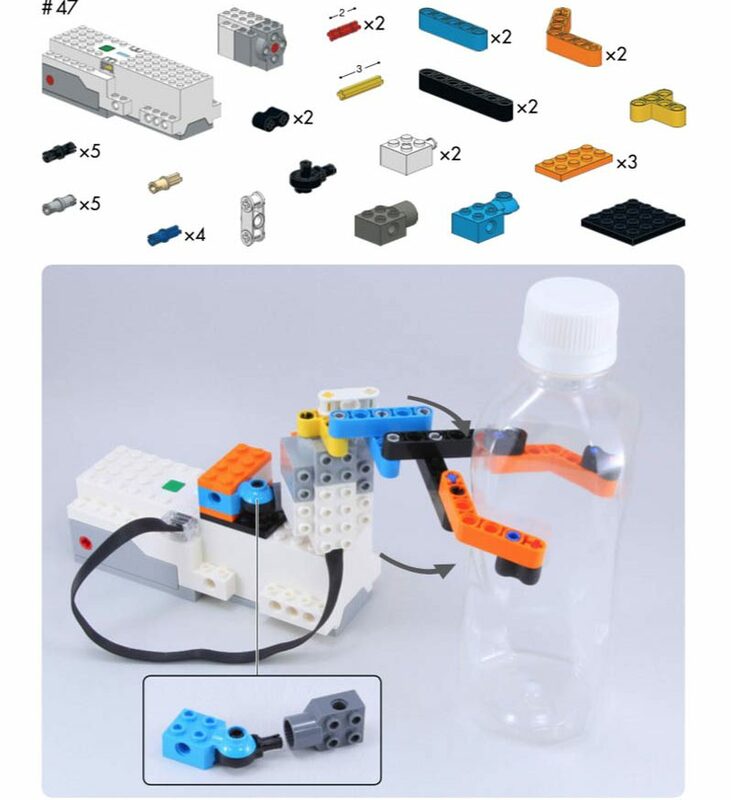 All projects only use pieces from the Boost set, so you won’t need to dig out for other pieces, neither will you need other LEGO sets to play with these projects. This doesn’t mean you can’t, of course, use other things, but they aren’t mandatory. Beyond the bare bones of the project, some projects have suggestions for improvement or variations. These ideas and tips are clearly marked as such. It’s a great opportunity to experiment and spark those creative juices into making new things. The book suggestions/variations on a project concept appear marked with a light bulb. All projects follow the same design pattern, visually, making it easier for the reader to understand the instructions provided. The extra, written tips ease the possible ambiguities and issues that might arise from the design choice of text-less instructions. 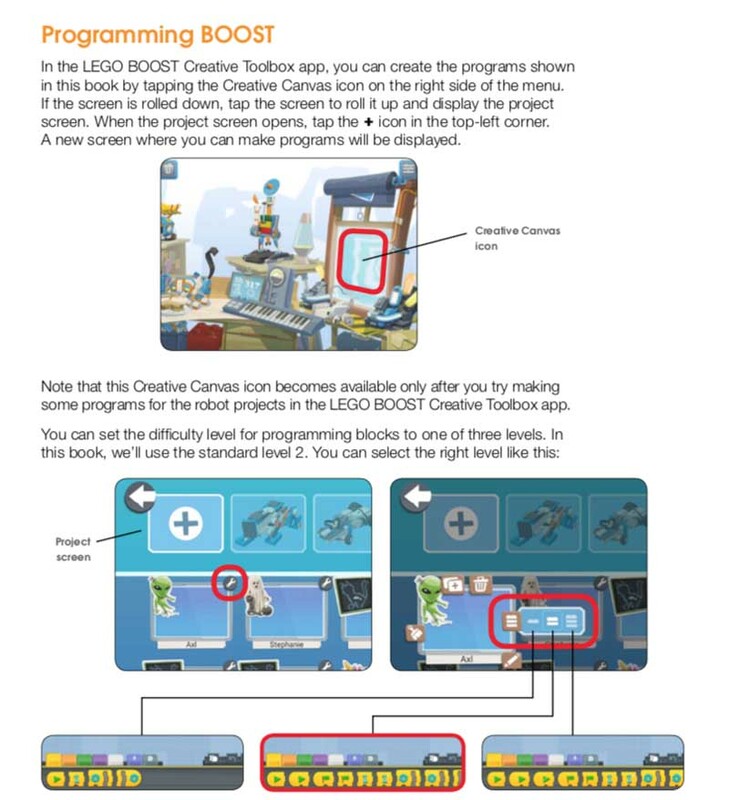 The LEGO Boost Idea Book does exactly what it says. But the way it does it is the difference. The wholly visual, no-nonsense, no-extras approach leaves just enough to engage and inspire future robot builders into creating their own projects. While the style of the book and the relative absence of written instructions for something that can be somewhat complex to grasp may baffle some, the book’s structures itself in such a way there is little problem to follow it. The incredible variety of ideas and suggestions both shows the functionality of different mechanisms but also the variety of things that can be done. LEGO is all about creativity and flexibility, and this book illustrates this perfectly well. The book offers practical mechanism ideas and suggestions. In a more practical sense, while the mechanisms are made to showcase Boost set capabilities, they are neutral. Clever readers may apply it to other things. There is nothing so particularly “Boost-like” that can’t be used in other things, though of course, the programming bits will vary then. As a final reminder, this book is not a guideline for how to use Boost sets. A minimum skill and familiarity with it are necessary for readers of this book. This book is definitely a 5 out of 5 stars. People interested in robotics, who want inspiration and knowledge to begin building their own things: this book is worth it.